This is Emily, cooking up some kiełbasa for a batch of żurek during one of our after-class activities. seemed like a good career move. I also have been fortunate enough to meet many wonderful Polish people, and I was won over by their warmth and enthusiasm for their beautiful country. accidently told someone I was delicious instead of tired, and asked for a date with a doctor instead of an appointment… But that at least I won’t make those same mistakes again. And I’m still holding out for a date with a Polish doctor. I chose Glossa because I wanted to go to a school in the centre of Krakow, that didn’t just offer classes but had a lively social programme, and Glossa seemed to fit the bill. I turned up on day one, only being able to say ‘Tak’ (yes) and tell the teachers I liked bread. Great start. But luckily I had two young, incredibly dynamic teachers, and despite not knowing any Polish whatsoever, all of the classes were given entirely in Polish. Imagine my initial horror, being faced with a crazy language full of consonants and a total paucity of vowels. The best way I can describe their approach was by teaching you language as if you were teaching a young child how to speak for the first time. Weirdly enough, it didn’t feel patronising at all, and it actually broke down language learning into manageable, bite-size portions. Classes were from 9.30 – 12.40 everyday, with a twenty-minute break, where we would hang out in the corridor, chat to other classmates in Polish (to some limited success, especially in my first month or so…) and solve the quiz of the day, which would include anagrams and completing what appeared to be a whacky Polish proverb. little bit of time to really think about what he was saying (Ryan had the most amazing vocabulary, but more on that later), and he would leave us in suspense. Ryan got us to lie on the ground, face down. As we were all on the ground, teacher included, and as we were waiting his next instruction, there was a long pause. We waited. And then we waited some more. As our faces were becoming better acquainted with the ground, Ryan let out an exasperated ‘uh…nie wiem!’ (Uh…I don’t know!) And after a good bout of laughter, we managed to stand upright and become vertical again. Q. I have a cold, what should I do? A. Take some paracetamol and drink plenty of fluids. We were all giving each other sensible advice, until it came to Ryan’s turn. We were talking about what possible remedies there may be to having the flu, and Ryan said, Potrzebujęsz alkoholu i spać! (You need to drink alcohol, and go to sleep!). This ended up becoming a running gag: i.e. I have a hang over, what should I do? Potrzebujęsz alkoholu i spać! Or even, ‘What are you going to do tonight?’, Ryan: ‘pić alcohol i spać’ (drink alcohol and go to sleep). Only now did Ryan confess to me that he rarely drinks alcohol, and looking back it makes the whole thing very funny! can find hearty delicious Polish food including soups such as żurek and barszcz czerwony, and you can find pierogi, breaded cutlets to name but a few items on the menu. and find out certain information, and even a trip to the local shopping centre where we had to go into shops and find out the answers to questions on a work sheet. 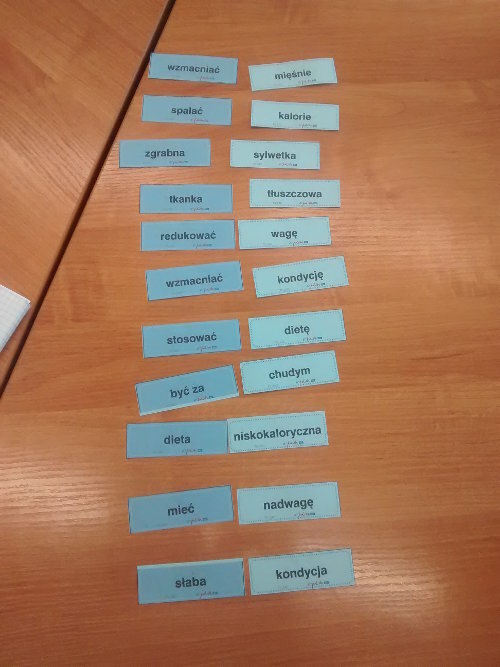 These were great opportunities to put your Polish skills to the test, and actually realise that you could communicate with someone who wasn’t your teacher. Krakow, and I hope to go back soon. Dziękuje, Glossa! A typical day of class. Emily on the right, Marcel (from Germany) in the middle, and one of our teachers (Jurek) on the left. I loved reading about the language school and all the activities. I love Ryan's blogs but I also really enjoy the guest bloggers too! I love it! Emily, you are great! To be myself, I had to correct one small thing: it's "potrzebujesz", not "Potrzebujęsz" :) (2nd, singular). If you wanna say in 1st, singular, it's going to be "Potrzebuję".